A movie came out in 2003 called How to Lose a Guy in Ten Days. Never saw it. Never had much interest. But it's almost certain that whomever is running Rudy Giuliani's campaign in Iowa saw it and decided to apply whatever lessons came from it to the political sphere. This is no exaggeration: The same campaign office was calling me every ten minutes on Thursday night. 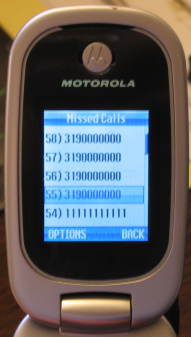 When I finally answered at 8:16 -- after ten calls in 48 hours -- what do you think they wanted to know? "Will you caucus for Rudy Giuliani?" Short of a personal apology? Not likely. Just about everything in nature has a useful purpose: Fires regenerate forests, lightning fixes nitrogen in the soil, and blizzards recharge aquifers. But ice storms? They just coat streets, break tree limbs, and leave a third of Oklahoma without power. And now it's Iowa's turn. Gee, thanks. 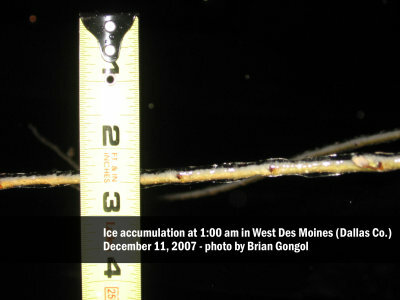 As of 1:00 in the morning, we already had almost 1/8th of an inch of ice everywhere.